· Follow a skincare regime (Describe your ideal skin care regime) that leaves your skin feeling 20! Thank u di for another amaxing giveaway!!! I really love using ponds products and the tagline attracted me 'googly woogly woosh'.. n coz of this only I got many compliments that I've got a very cute, healthy, adorable n flawless skin. People compliment me that I have a natural blusher and I don't need a blusher, lol. Hi thank you for amazing giveaway. I am die hard fan of Ponds since my teenage starting my journey from its winter cold cream till Ponds BB cream. Whenever i use Ponds BB cream i get loads of compliments telling i got flawless skin having natural glow. I never leave my home without wearing it. Its the best compliment i always gets where my husband just stares at me :) and for my acne spots i use Ponds white beauty cream which fades my spots overtime and gives me clear skin. First of all, thanks Radha for organizing this giveaway. Second, thanks Ponds for being a part of such fin giveaways.. after all, who does not like winning a contest and when it is a beauty product giveaway, it is all the more exciting!! As for the compliments, I am a Doctor by proffession and my work requires me to look simple. So, I cannot go overboard with makeup on my regular working days!! I once got a surprise visit from the guy I love.. Even with no makeup on, he looked at me with such gleam in his eyes and said, '' you look glorious!!'' It made my day, given the fact thats ours has been a long relationship and in such a case, things tend to get stale. So, that day I thanked myself for not taking my skin care for granted, as a result it looks good even with minimal makeup!! My skin care routine is basically about cleansing and nourishing my skin. I use a mild facewash in mornings and a deep pore cleanser in evwnings. In evenings, I also do cleansing with olive oil to remove deep seated makeup residues. Follow with toning with Rose water and a light lotion. At night, I put on any lotion with retinoids. Twice a week, I do exfoliation with Oatmeal and Apple homemade scrub. For face masks,I use a papaya and Orange juice mixture as a mild AHA and antioxidant dose. A healthy diet with ample sleep, faith in God and lots of Green tea... trust me, you would not need makeup!! I like how honest you are about compliments and how it makes us feel. Wish more women will be like you and admit it. I am the same because as said in bold words "Who doesn't like it". I am not eligible for the give-away and so, best of the luck to the rest. Golden days always left those remarks which cherish you throughout your life. I was born with a good volume of hair and good skin with a wheatish colour . Those days most of girls ask me about wonderful skin and how it is so supple? That time my mother plays a vital role in taking care of my skin. She makes herbal pastes of Besan, lemon, Raw milk & soaked Chironji. After that I apply a layer of raw Aloe vera. As I am growing so the needs of skin is also changed, now my use a homemade herbal paste to tone my skin : Multani Mitti, Raw milk, Few drops of lemon add water (extract of neem& tulsi). And then to moisturize my skin apply raw Aloe Vera. I use to apply this paste twice a week and I am also very particular to this also to nourish my skin. Yes, Ponds supports a lot to make me feel & look younger, I am 35 years old now so an age defense cream is my skin’s requirement. 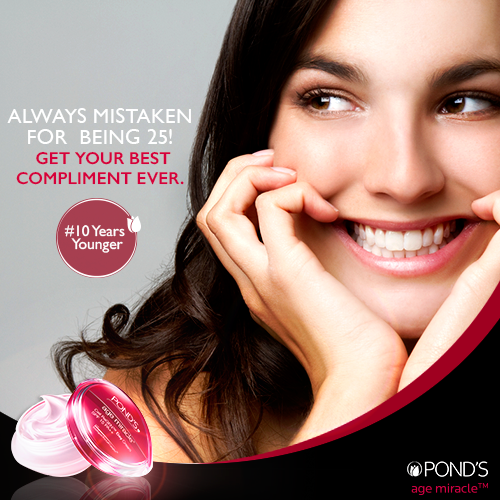 Ponds Age Miracle Daily cream is companion which always stay with me. I use to apply it on my face in the morning. I love using ponds product too...n ppl says u dnt need makeup n the reason is I do excercise everyday n I think that makes my skin more glowing n healthy...love this contest rads ...love u. Then a Aunty came n sat beside me n stared talking about how the college students get dressed n get their make up done all .... N she asked Me... " So tell me What U college going students buy Your cloths n What n all healthy routine U follow to keep Yourself so Clean n glowing all the time... ?" Oh My God, I was so happy with Myself, That Aunty thought that I was one of the College going student.... That Was the best compliment That i got in a while... really made me blush a little bit.. :) :) :)..
compliments is a magical thing that makes me smile and feel happy. So,The best compliment i have ever received from my cousins whenever they comes my home they ask me your skin looks best ,good-looking what creams did you use ?? how your skin is glowing day by day??? The best compliment i have received till now and also still receiving is that "I am soo young, after having a baby of 2 years." My age is 29, but still nobody says that i an 29. Everyone says that you do not seems to be a Mother. The best part is i am using Ponds Age Miracle Face Wash, Ponds Age Miracle Day Cream & Night Cream daily. I hope to get lucky with you and win them because they are a beautiful part of mine. Wish to win. Sharing daily on facebook & Twitter and tagging you too. I remember when I was at Canada and we were about to enter a casino and we were 5 of us and while entering, except me they left everyone inside and they asked me for an ID proof to check my age as they thought I was under the age limit to enter a casino :D I was all smiles since I was at my late twenties that time :) Since I didn't carry my wallet, they didn't let me in! wow..!! It's such an amazing and 'miraculous' giveaway. 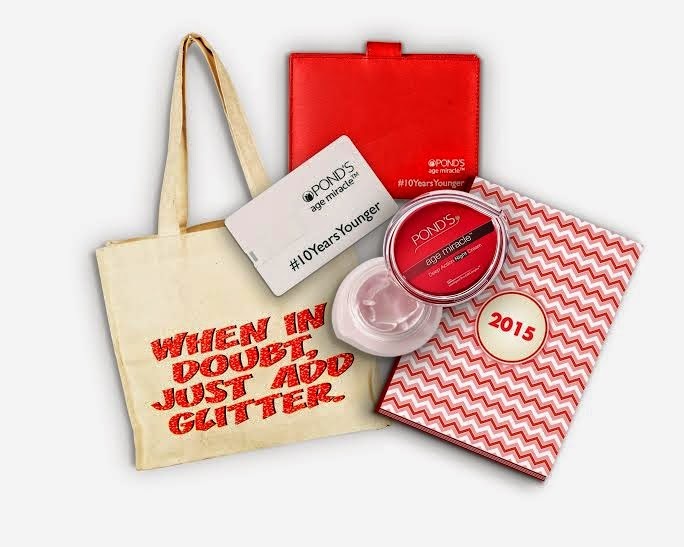 I loved that cute tote bag with such a 'glittery' one liner. Loved that pretty 2015 planner too. I am a fan of Pond's and is using it's cold cream and body lotion from last 14-15 years. As I am still in my early twenties, so its bit early for me to try ponds age miracle but as soon as I'll cross 25, I am sure gonna use it. So, in case I'll win this huge giveaway, I'll gift the cream to my mum. 1) My skin care regime is pretty simple, blame it on my laziness. First I clean my face witj Cetaphil cleanser and then use Aroma Magic's Lavender Face wash. After Cleansing, I apply Moisturiser followed by Sunscreen Lotion. Repeat the same cleansing process in the night and apply Kama's Kumkumadi Tailam. I am totally loving it's after effect. As I have sensitive skin, so I exfoliate the face once in a week and use face masks/packs whenever I feel my skin needs some pampering. Basically I am damn lazy and careless when it comes to pampering the skin.